Mother of pearl, it’s the first day of February. I LOVE FEBRUARY. I know that Valentine’s Day can be quite the sore spot for a lot of people, but for me I have very fond memories of elementary school, where I would carefully craft a Valentines box for that special party day at school, and then spend an entire night wisely delegating which of my Valentines should go to which classmate (because “u r 2 cute” could mean a lot of things depending on who you give it to, okay!). To me, I think Valentine’s Day is just about sharing the love with, well, whoever you love–regardless of your relationship status. Whether it’s friends, family, co-workers, or significant others if there’s a person you love, why not use Valentine’s Day to show it? I mean, I always enjoy a good excuse to give a cool gift, and I hope today’s post helps inspire you to give to the Doctor Who fan in your life! If you are purchasing for someone else rather than yourself, and are otherwise unfamiliar with Doctor Who and its fandom, the one thing that you may, at first, find daunting is the fact that Doctor Who has been around for, well, a really long time. This BBC sci-fi program has been around since 1963. The Doctor, a Time Lord and extraterrestrial being, will regenerate every so often into a new incarnation, essentially being reborn with an entirely new appearance and personality, but remaining within a single narrative. Basically, there’s a lot of Doctors–number thirteen, the first female Doctor, makes her debut this year–and if you’re a fan of Doctor Who, you’ve most likely got a favorite. The faces of all thirteen Doctors. But don’t let the magnitude of the fandom scare you! Really, as a Doctor Who fan myself, I’m just ready to scream in joy over any gift that is tied to a fandom I love! Luckily for you, Nerd Love Shop is here to provide some options. ‘Cause if there’s one thing we have in the shop, it’s Doctor Who apparel. Well, you’ll remember me a little. I’ll be a story in your head. But that’s OK: we’re all stories, in the end. Just make it a good one, eh? Because it was, you know, it was the best: a daft old man, who stole a magic box and ran away. A piece of a fantastic quote from the series that was spoken by the Eleventh Doctor. Available on white 100% cotton women’s fitted t-shirt as well as in adult unisex sizing. 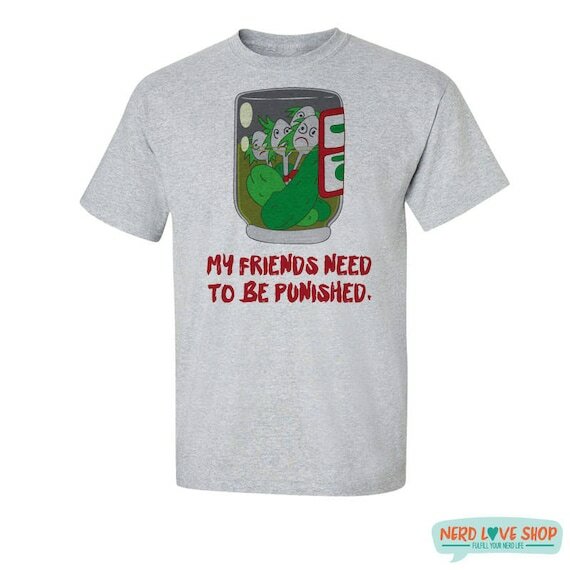 An obvious win of a gift if you’re looking to select something for your special something, but how fun would these shirts be for a set of BFFs as well?! The Doctor and Companion couples t-shirts are offered in a heather gray in both women’s fitted and adult unisex sizes. Always take a banana to a party, Rose. Bananas are good. Possible the soundest wisdom you’ll ever hear. Thanks, Tenth Doctor! Available in women’s fitted as well as adult unisex sizing, our Always Take a Banana to a Party shirt is basically genius that you can wear. Perhaps one of the most tear-jerking moments in Doctor Who ever, it’s one that should never be forgotten. I won’t spoil too much for anyone who hasn’t viewed the series but wants to, but basically, this is a freaking romantic thing to do, trust me! I’m Burning Up a Sun Just to Say Goodbye is also available in women’s fitted and adult unisex sizing. Being a Doctor Who fan, we have so many great quotes and characters to pick from and love that you really can’t go wrong! When venturing out to purchase for a diehard fan, if it’s got the Doctor in some way, you’re set.